This form is used by those registered on the Early Years Register from September 2008 and delivers the Early Years Foundation Stage. It does not need to be completed by independent school or any maintained that has registered early years provision or those only registered on the Childcare Register. 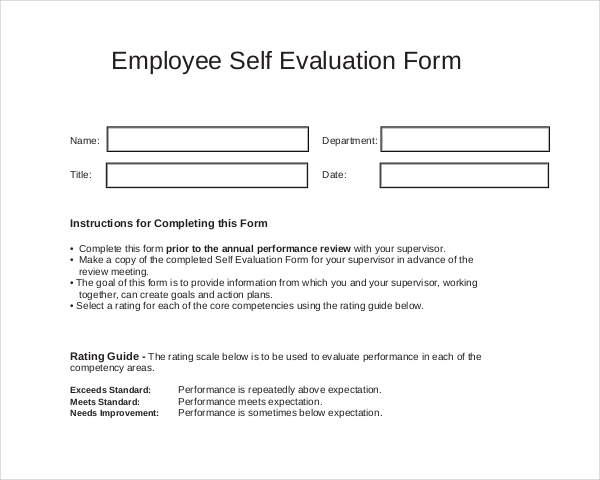 This form can be used instead of doing a Self-Assessment based upon definite performance expectations. This form requires certain information like a person’s job requirement, changes, strengths, weaknesses, performance and expectations. They have to include a statement about job-related training requirements and future career plans. This form requires one to evaluate whether they can achieve excellence in every task without losing focus in problematic situation. It analyzes whether they can break down obstacles into various parts to address the inherent root cause. It requires them to answer some tough questions which can make them think deeper. This form analyses what the person think about the priorities of the company and as his/her greatest accomplishment or effort. It further informs what his/her co-worker/supervisor does to help them achieve goal. The form further analyses in which areas he/she will like to gain more training, experience or education. This form aims to help applicants find ways to enhance their proposals. It is based on the standard criteria and thresholds. The applicant is required to mention their main accomplishments, goals, and challenges in the rating period. It analyses their objectives and ways the applicant can improve their performance. Using this form, the applicant rates their fundamental qualities and characteristics. 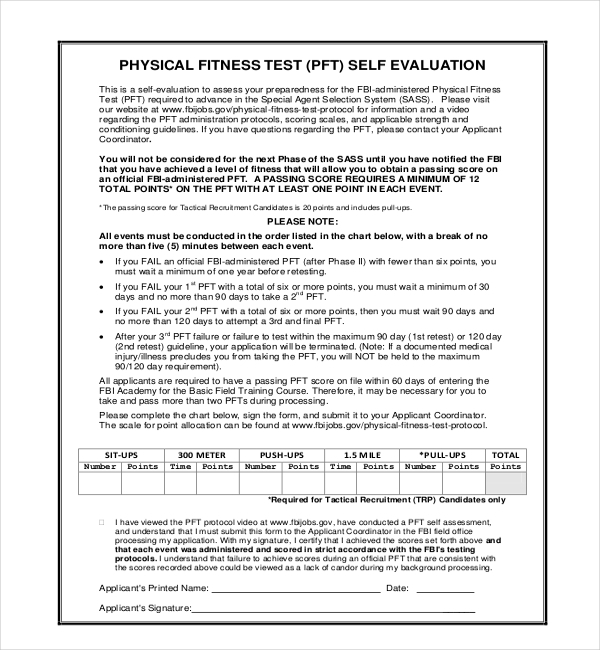 This form requires the person to analyze their mental, physical, emotional, and technical strengths. The form further evaluates their conceptual, interpersonal and influencing skills and whether they employ sound judgment and logical reasoning and wisely uses resources. This Form gives periodic written review of a person’s performance. It is created to facilitate constructive conversation between the employee and manager to clarify performance purposes, give feedback regarding the employee’s performance with respect to behaviors and skills and give a framework for finding the employee’s advancement plans. 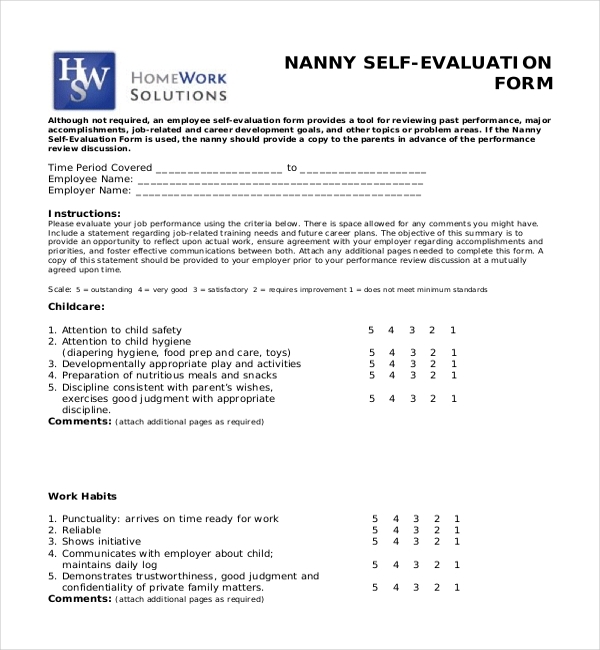 When this Form is used, the nanny should give a copy to the guardian/parent in start of the performance review discussion. The aim of this summary is to give an opportunity to reflect upon real work, make sure agreement with the employer about priorities and accomplishment, and foster communication between both. This form requires the applicant to evaluate how often they contribute ideas, listened and respected the idea of others. It analyses whether they compromised, cooperated and positively encouraged others in their group. It evaluates the applicant’s strengths, weaknesses and whether they took risk or initiated something in order to explore new things. Anyone can check his/her strengths, weaknesses and many other personal details using this form-template. 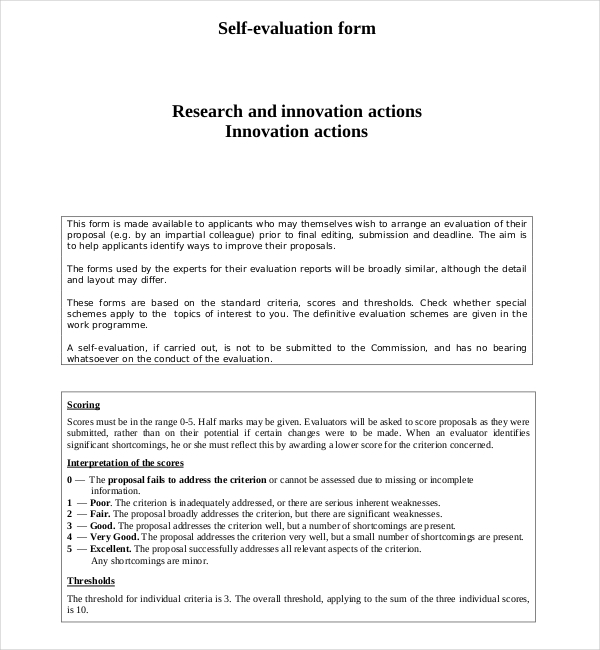 While submitting their work, they can fill out this form to give an evaluation of their performance. 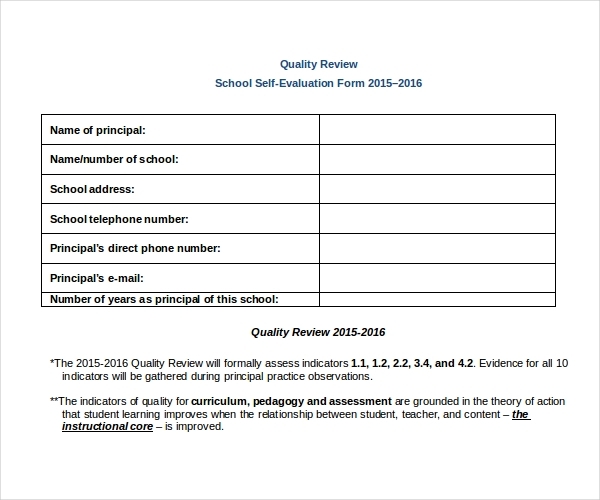 This form can assist them enhance and improve by reviewing their own feedback and provide better work in future. One can customize or directly use this template form as per their requirement. 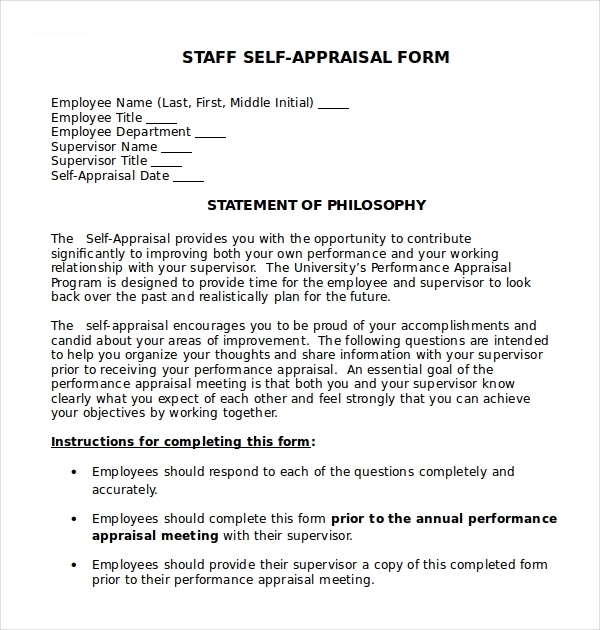 The applicant can guide themselves by reading their own feedback. They can also add the number of objectives they want to fulfill in future. The person should skillfully describe their job, performance expectations, review and report their performance. This form is used by the employers to analyze their performance while presenting their work. The evaluation results should be used by them to enhance their work’s effectiveness. This form is used by them to analyze whether they created a setting for positive working experience. They have to further explain the way they did it. This form is used to understand the best and worst things about themselves. He/she has to explain the ways they plan to improve themselves. They have to rate their own character, personality, knowledge and working style. It is used to explain what they like and hate about themselves. The applicant is required to describe the way they will assess their job performance over the past review period including their special projects, particular accomplishments and demonstration of strengths during the time. They have to comment on any challenges or obstacles that prevented them from achieving their aims or effectively completing their work projects. They have to further describe how these challenges will be overcome in future. The employee has to mention if there are any specific areas for career or professional advancement by including concepts for skill improvement, future goals, training, and/or career guidance. They have to mention the way their supervisor will be helpful for them in future. They also have to mention any additional topics which they will like to discuss with their supervisor in their review meeting. These forms are for anyone who likes to give feedback to their own work even the freelancers who find online job opportunities. It will help them determine their own goals and objectives and which methods they can use. He /she can complete work faster in future by finding a solution. These forms are for anyone works energized groups to complete tasks. The employee can make a huge difference by getting a supporting and trusting climate. After using this form, the employee will take help vital for their success on the work provided. They should take any important documentation. Employees might start understanding their job and organization in a new light. They can start developing and showing confidence in the work place. They can start organizing the work in a coherent way. This form is helpful in building understanding about expected job performance. It is better to analyze themselves what is expected to deliver acceptable performance. Thus, it will provide huge chance to the employee to execute the work in a satisfactory way. The purpose of self evaluating is to know their own strengths and find the areas of needed improvement. They have to explain whether they speak clearly and are they well organized and well prepared to get better understanding of the work. There was a time when people used to buy the forms for the purpose of self evaluation. However, today, these forms are easily accessible for anyone online. They can randomly click on any form of their choice in their own preferred Word and PDF formats. Some people doubt online forms; however, these forms come completely error free in some selected websites. They can randomly download and easily print them within a few seconds. 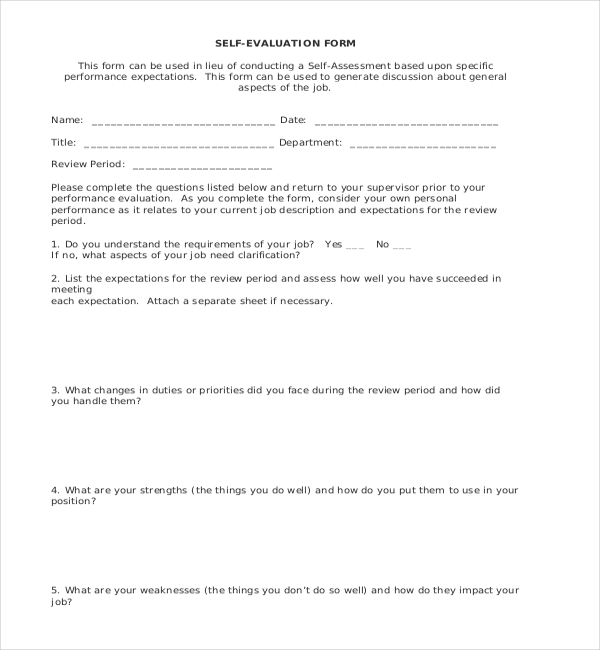 We have made the self evaluation forms available for you in various versions of your preference. If, an employee wants extra customization, we can definitely help them. They don’t need to doubt the forms available on our website, successfully download these forms. For self evaluation, these forms can be randomly downloaded and customized online. It is vital that the employee focus on each detail in order to avoid missing out anything important. 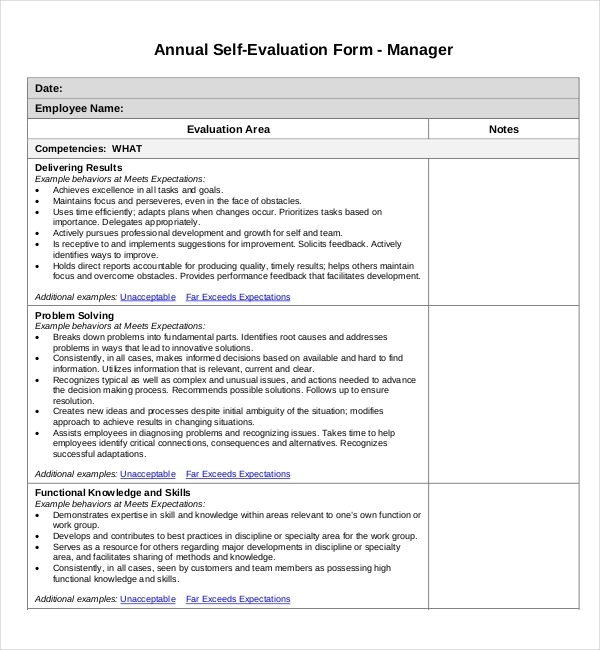 The self-evaluation form assists supervisors to gain knowledge and feedback from their employee so they can trust them in future. It is not the place to point out problems in their job. He/she should find the needs most important to the supervisor, agency and employees in terms of their overall job performance. In this process, employees might learn to get more responsibility for learning.